Fortnite is Booming! as the game is growing difficulty of the game is also increasing tremendously. Fortnite is currently rated one of the difficult games to win in the Battle Royale Genre. Which is true because it used to take me around 100+ games to get a single win in solos, but now after I have mastered the game playing for more than a year now I have managed to get really good at the game and get win every single day. People have been asking me How to get better at Fortnite, so I thought why not put up at tips and suggestions that worked for me and helped me Victory Royale all the time. The first thing you need to do in the game is to pick a spot and land, so it is really important to pick the right spot depending on the situation. If you are not aware of the all the landing spots and their advantages then you really need to play the game, land at different spots, analyze and then understand all the place. Just make a strategy on how you want to approach the game and trust your instincts. Either attack or try sneaky methods to get a Victory Royale. To completely understand make sure you play the game a lot of times before coming down to a conclusion. Fortnite is all about building so if you need to win, then you gotta built. I can understand that building is not that easy and also during fights, we tend to panic and shoot but not think about building but trust me building in the most important aspect of this game to win. Once you land makes sure you try and collect all the materials so that when you get into a fight immediately when you land you might require every the little material or resources that you collected once you landed. This is the only reason I suggest you to collect the materials ASAP (As Soon As Possible) you land. Doesn’t matter if its Woods or Brick or Steel. In Fortnite Materials is as important as Guns and Ammunitions. Don’t forget to utilize the materials or the resources that you have collected in the game because most of the players who tend to collect the materials or resources and then forget to use them in the game. I know this is an honest mistake but don’t try to repeat this mistake. When you spot a guy try and built ramps to get a high ground so that you have high chances of winning the fight because the high ground in this game is crucial because of its advantages. 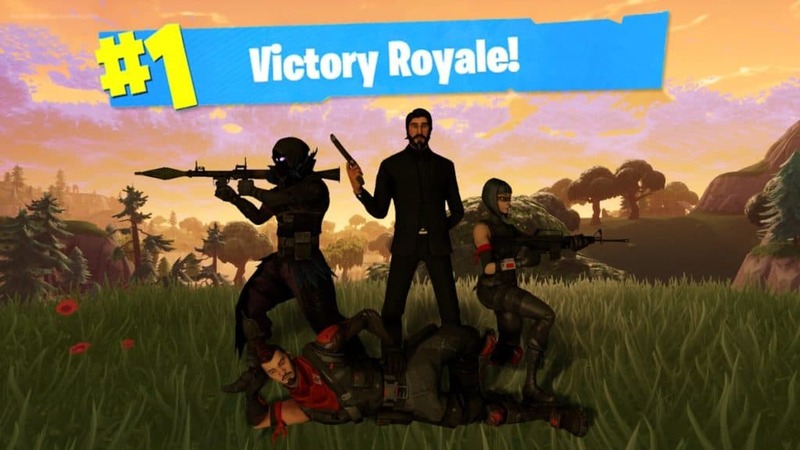 Fortnite is a First Person Shooter Battle Royale Game so you need to shoot and eliminate people to win the game and get Victory Royale. So you need to Understand about How each weapon in the game work and learn about its Advantages and Disadvantages depending on the Location, Situation, and other factors. I and most of the fortnite players believe that each weapon has its own advantages and disadvantages depending on the location. Also it very important to understand Rarity of the weapons in fortnite for knowing their potential. Remember—the rarer the gun, the higher its damage, which usually means its DPS is higher as well. I really can’t emphasize on this. Headphones or Headset are really important if you need to win the game in Fortnite or any First Person Shooter games like Call of Duty, Halo or Counter-Strike. Headsets are very important because these games are not so instantaneous it requires you to camp and waits for the opponent or hear their footsteps and make the attack. So you will be losing out big time if you don’t use headphones or headsets while playing the game. This can be really helpful. A lot of professional fortnite players nowadays stream their everyday gameplay live on Twitch so make sure you follow some of them and watch them play regularly and use their methods, strategy in your gameplay. These players some time give tips for their viewer on some of the important stuff in the game which will help in the long run. Try and ask them some questions too in the chat, they might answer it, depends on your luck. Well, these are the tips on How to Get Better at Fortnite that I currently remember. I hope it helped you to get Victory Royale. I will be updating more tips and tricks once I find them. If you have any doubts or problems then please don’t hesitate to comment below. If this was helpful then please do share it with your fortnite buddies so that they can learn and together you guys can win a lot of games in Duos and Squad. Thank You and Victory Royale. Anytime. Hope these Fortnite Tips help you improve your game. Let’s get those Victory Royale! Yes, will be working on it as the game proceeds. Thank you for excellent information I was on the lookout for this information for my mission. Why do you think so? Which tip is not working for you? Thank You Jesse. Maybe he is.